I spent a good chunk of the day trying to solve a performance problem. After approximately 100,000 bullets were fired, the framerate would drop to an excruciating 16 FPS. I found out that there was a memory leak in the game engine – every time a sprite was created it calledsetInterval but it did not call clearInterval when the sprite was deleted. Ever since I fixed the issue, FPS has stayed at a nice and smooth 60, no matter how many objects are created and destroyed. 9pm – Miscellanous small enhancements. 11pm – Fixed the performance issue. 12am – Added the new thruster sound that Michael gave me. 3am – Added Sandbox Mode. 4am – Added more features to Sandbox Mode. 6am – Added Ctrl+A to select all your ships. Also made WASD and J work the same as arrow keys and space. 7am – Added dogfighting mode. 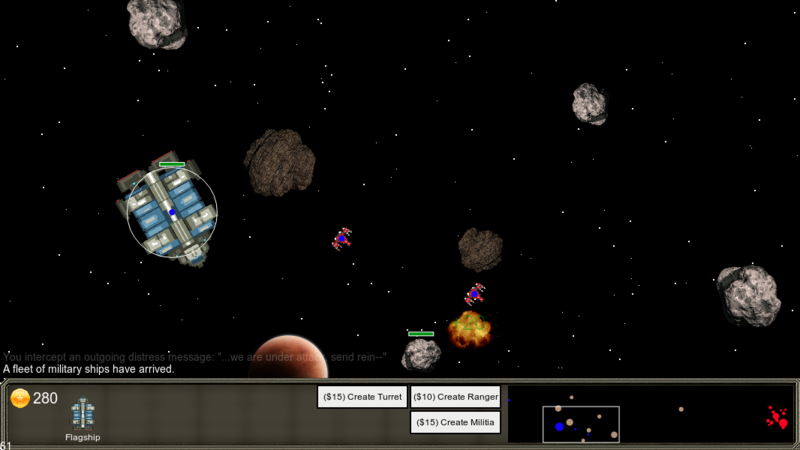 8am – Added graphics so that ships display their targets when selected. 8am – Added 2 more dogfighting levels. Enhanced manual piloting of Militia ship so that you can use your melee attack. I have only 2 days left to work. The last day will be primarily reserved for gameplay tweaking, bugfixes, touchups, and testing. That leaves only 1 more day to make actual progress. Add a rotating turret to the flagship. Add a civilian to Level 1 and use that to explain the Move command vs the Engage command. 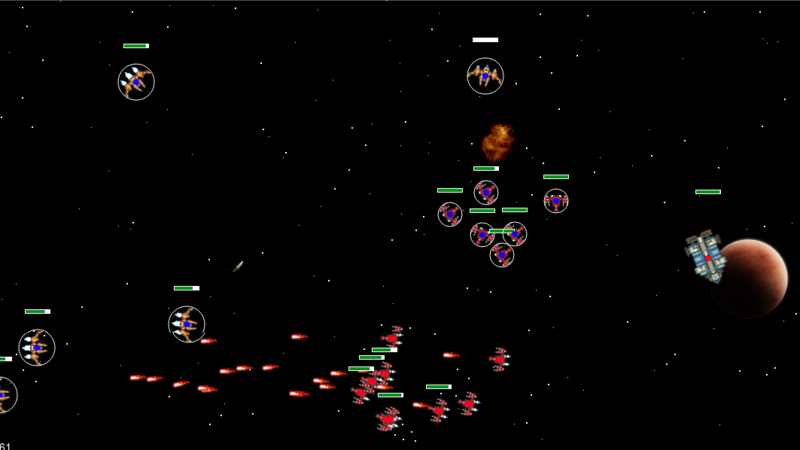 Add a dogfighting level where there is an ongoing battle and you have to rack up a certain number of kills to win. Add more campaign levels. I reserve the right to ramp up the difficulty in the later levels! Add some more ship classes and implement upgrades. Thanks to the folks in the #7dRTS IRC channel for helping me playtest today. Specifically Zapa and Orava. You can try the game out now. It has been wonderful relying only upon circles in this physics engine. The math is simple and beautiful, and it’s easy to write fast code. Who needs polygons anyway? 5pm – Added more of Michael’s sound effects into the game. 5pm – Tweaked the physics. 5pm – Added some cheats to help speed up testing. 6pm – Added text in Level 1 to explain controls. 7pm – The game shows how much cash you have. 10pm – You keep your same fleet when progressing to the next level. 12am – Added a new Level 2. 12am – Made unlocking ships work. 12am – Made it so you get cash from killing enemy ships. 12am – Tweak the money system. 1am – Made it so you can scroll and give orders while paused. 1am – Fixed some game crashes and bugs. 2am – Modified attacking AI to stay within certain speed limits. Makes the game less chaotic. 3am – Added ability to skip tutorial levels. 4am – Better squad formation. 4am – Updated the Move & Engage command to be more effective. 6am – Added Civilian ships and plan out Level 4. 7am – Add Artillery ship and finish implementing Level 4. 8am – Fix the crash which happened at the end of the demo below. Today Michael gave me the first music track he composed for the game and I am impressed. I am excited to have professional sounding music for a change. That being said, the first thing I did after inserting the music into the game was program a mute button so that I could keep listening to techno while I coded. Michael also delivered an electric explosion sound effect that works perfectly. I mentioned yesterday that I could not find a meteor graphic to use on opengameart.org. I actually did end up finding art that works really well by searching for “rock”. I wonder if this is considered good enough to submit to opengameart.org. 3pm – Finished electrical disintegration animation and added sound effect to game. 3pm – Added in Michael’s background music and made it so you can toggle it with M key. 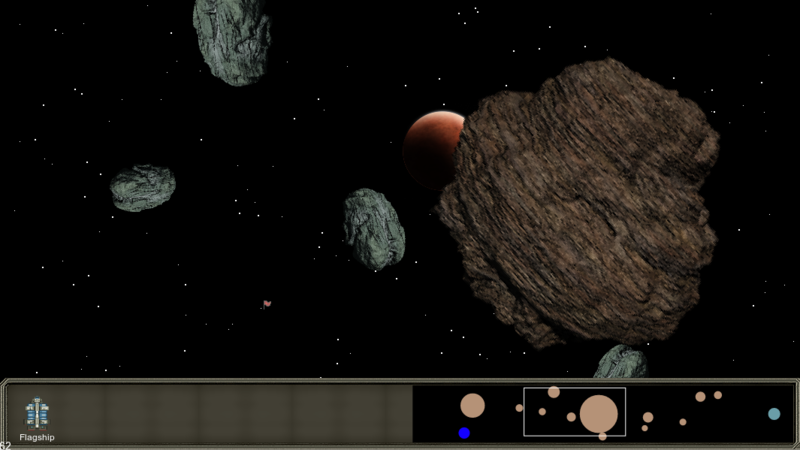 5pm – Added meteors with collision detection. 5pm – Fixed “ships rotating for no reason” bug. 6pm – Inserted a new Level 1 – meteor field that you have to navigate through. 7pm – Created a spastic portal graphic and added it to the level. 7pm – Fixed navigation bug for ships equipped with backwards thrusters. 9pm – Fixed scrolling when manual overriding. 11pm – Added a UI pane when ships are selected. 12am – Added a mini-map. 1am – Made it so you can send ships into a portal. 3am – Made it so selected portal shows what’s inside it. 4am – Added ability to send ships out of a portal. 5am – Added announcement support. 6am – Made your convoy show up on the level complete screen. 6am – Added stats to the level complete screen. 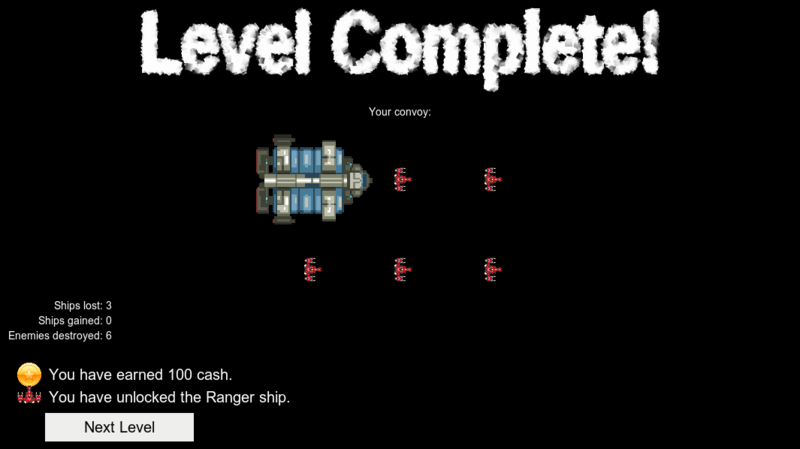 8am – Finished level complete screen so that you can get to the next level. I actually feel pretty good about the code organization right now. I have only had to pause progress and refactor 2-3 times and each time it was mostly painless. Enough of the technical stuff. Let’s see some screenshots. Add text instructions in Level 1 to explain the controls and how to beat the level. Make it so that you start out the next level with the same fleet that you exited with. Allow you to create ships that you unlock by spending cash. Insert a level between 1 and 2 with some attackers. You’ll have to build some Ranger ships to defend your Flagship. Figure out why the game slows to a crawl when many ships are added and then deleted. If Ranger is in range, don’t accelerate toward target. When forming a squad, don’t assume all ships have the same radius. And now I must rest. I am exhausted. opengameart.org has been very good to me. I think this will be my new go-to game dev art supply. So far I’ve found everything I’ve wanted on that site, except for a meteor sprite. Maybe I’ll make one and contribute back. 8pm – found out I was using t * a ^ 2 + t * v for acceleration instead of a ^ 2 * t + v * t. I fixed all the math and made ships arriving at gather points nice and smooth. 5am – added title screen, credits screen, and game over screen. I made it possible to win and lose the game. Again, you can playtest this game in your browser right now using the same url as Day 1. Feel free to give me feedback or advice. Basic cheap unit. Has short range. Agile. Actually doesn’t shoot lazers, shoots a short range but powerful lightning attack out the front. It must resort to charging other ships to attack them. Short range weak lazers. Less agile. Less defense. In a level, a Militia should be able to overtake a Ranger and kill it. Slower, shoots big lazers. Slow moving, weak defense. Does not attack. Has high defense. Moves very slowly. Communicate with others to divide up the targets evenly. Update bullet count to 3. You will start with only a flagship, and as you progress throughout the campaign, you will start to build up a convoy that gets ever bigger and more powerful. You’ll need it to be bigger and more powerful to get through later levels, in fact. Build simpler level 1 where you only have to navigate your flag ship around meteors. Give the player some cash and let them choose to build Ranger ships or Militia ships using the Flagship. Create level 2 where you have to destroy the enemy flagship and then fly your flagship through the created portal. I’m at a pretty good checkpoint right now. I’m calling it a night. I have decided to participate in the 7-Day Real Time Strategy Challenge, July 2013 edition. I am working with Broken Sounds who will create sound effects, music, and be in charge of the “atmosphere” of the game. I am using chem, a canvas-based game engine I made for rapid development occasions such as this. It has been working out quite well and I think it has been playing a large role in my productivity today. 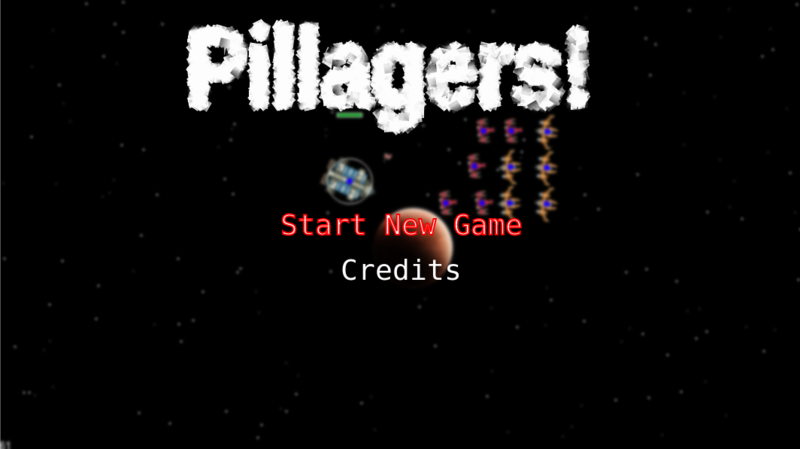 The game is codenamed “pillagers”. 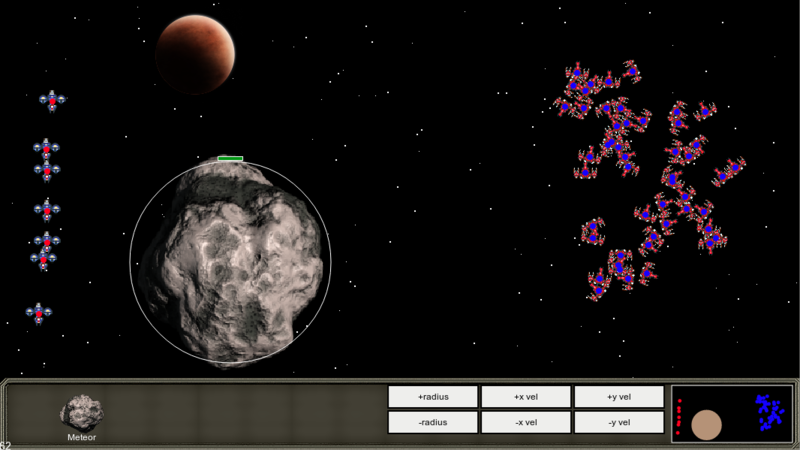 The idea is to mix space physics with real time strategy and see what comes out. Instead of creating a carefully planned out base, you will be campaigning through levels, pillaging for resources. That’s the idea, anyway. We’ll see how it pans out. Selecting squads and telling them to move around. Ships shoot enemy ships, destroying them when their health reaches 0. Auto generated parallax background with stars and a planet. It was a fun challenge to write the AI to get the ships to stop at the intended destinations. As is it’s not optimal, but I think that’s okay. Maybe later classes of ships will have better AI. You can actually play this game right now. Since it’s web based, you don’t even have to download anything. Edit the main militia ship to have short range. Auto targeting enemies should only work when close enough. Ability to right click an enemy ship to tell squad to target it. 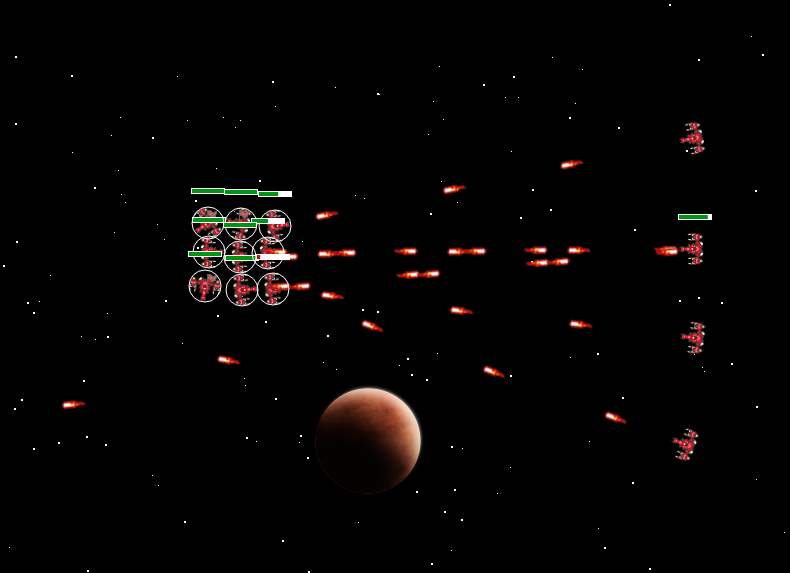 Add enemy turrets and ships to level 1. Add enemy flag which grants victory when destroyed. Add 2nd class of ship which you get some of at beginning of level 1. Instead of giving the player ships at the beginning, give them cash and buildings which they can use to create the ships they want. The user will thus be able to choose how many of class 1 and class 2 ships they want. Put instruction label text in level 1 to explain the controls. Well, I’m off to bed to get some rest. Looking forward to Day 2! Hello there! I am happy to finally participate in a Ludum Dare. I look forward to playing everybody’s games. I thought I would share this project of mine called chem. Automatically creates a spritesheet for your assets and then loads the assets at runtime. Uses browserify to compile your code which allows you to harness the power of code on npm. Allows you to organize code modules using require and module.exports syntax. Everything from code to spritesheet is compiled automatically when you save. Handles main loop and frame skipping. Handles all the boilerplate for keyboard and mouse input. In addition, the README has an introduction and the reference API documentation.